Whether you're a teacher looking to make extra money over the summer or a student, who needs a summer job, there are many summer jobs where you can work with animals. The work can be extremely fulfilling, but keep in mind that working with animals can be physically demanding. If you're okay with hard work, check out the six jobs below. Veterinary clinics, especially small animal clinics, frequently hire help during summer breaks for kennel attendant or veterinary assistant positions. Kennel attendants are primarily concerned with cleaning cages, walking dogs and assisting with baths. Veterinary assistants hold animals for procedures, interact with owners and help technicians and veterinarians with exams. Some large animal and equine vets may also hire summer help but these opportunities tend to be much harder to find, especially if you don’t have prior experience. Pet stores may hire seasonal help for the sales floor. Pet store sales associates may be involved with cleaning cages, restocking merchandise, making product recommendations to customers and operating the cash register. Night, weekend and holiday hours are common in this industry, especially with the larger chains, so these gigs are best for those who can work a varied schedule. Many shelter and rescue facility positions are unpaid volunteer opportunities, but they are a great way to get the experience necessary to secure a paying position the following year. Duties usually include tasks such as cleaning cages, assisting with adoption paperwork, walking dogs, grooming, bathing and other general animal care tasks. People with equine knowledge may find jobs at riding stables, camps, or other equestrian facilities. Position titles for summer employees may include groom, riding instructor, camp counselor or assistant trainer. Depending on the specifics of the job, you may be involved in mucking out stalls, riding, teaching lessons, grooming, feeding, turning horses out and other duties as assigned. Compensation is generally not high for equine positions, but there may be a variety of fringe benefits such as complimentary lessons and riding privileges, room and board at overnight camps or the opportunity to compete in shows. Many zoos offer summer programs designed to give college students a taste of what it would be like to work in a zoo environment. Zoos tend to refer to these programs as internships rather than true employment opportunities. Students should not expect to handle exotic animals directly, but they may be able to shadow zookeepers as they perform general habitat maintenance or assist zoo educators as they conduct tours for visitors. Some zoos also offer camps for young children and seek energetic teens and college students to serve as camp counselors. Both paid and unpaid opportunities may be available, and compensation can vary greatly from one zoo to the next. Established pet sitters or dog walking services probably won’t be hiring summer help, though it never hurts to ask. You could also start your own seasonal pet sitting service at little to no cost. Start by advertising your summer availability to friends, neighbors, and classmates. 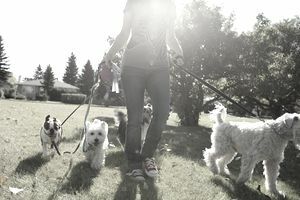 Summer is a very high demand season for pet care services since many people take vacations during this period. You might even be able to turn this summer business into a year-round operation, depending on your availability and course load while enrolled in school.